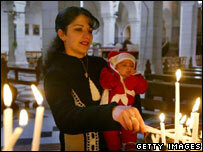 The little town of Bethlehem is perhaps more associated with Christianity than any other place in the world. But now there are fears that soon it could be home to hardly any Christians at all. To get into Bethlehem from Jerusalem you have to go through a checkpoint. Actually nowadays it looks more like a border crossing. Israeli security personnel sitting behind blast-proof-glass ask for your passport. Soldiers stand, rifles cradled in their arms. The barrier goes up, and you drive in through a gap in the 30-foot high concrete wall that Israel says it has built to keep out suicide bombers. 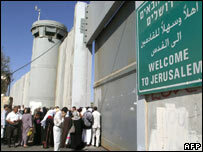 The wall now separates Bethlehem and Jerusalem - two towns that have been linked for centuries. A short drive down the road, in her living room, Reem Odeh brings out the drinks. Tiny cups, black Arabic-style coffee frothing at the brim. She sits down on the plush purple settee. Then she and her husband explain why they are about to become the latest Christians to leave Bethlehem. "Everything here is difficult," says Fouad Odeh. "Like work - I stay every day two hours at the checkpoint before I get into Jerusalem. Every day two hours." Reem Odeh looks resigned. "There's no work, the children have no place to play. We don't want to leave here and go to America, but you know..."
They are not the only ones going. The latest figures published in early November 2006, show that Christians now account for just 15% of the population of Bethlehem. Not so long ago they were 80% of the town's population. Life is difficult for everyone in Bethlehem, but it is more often the Christians who have the means and the contacts abroad to be able to leave. George Ghattas works for the Latin Patriarchate here, trying to encourage Christians to stay. "From a statistical perspective and the way things are progressing politically and socially there is a problem," he says. "The changes are very drastic and very dramatic in a very short space of time." In a small Christian workshop on one of Bethlehem's narrow lanes, a man is carving an olive wood souvenir. But there is no one to sell it to. Walk down the lane, and shop after shop is closed, locked behind light green metal shutters. Tourism may have returned to Israel, but few travellers attempt the journey through the Bethlehem wall. At the end of the lane is Manger Square. If you arrive at the right time you will hear what a mixed town this is. The muezzin's call blares out from a mosque on one side of the plaza. And then, very faintly, you might be able to make out the sound of the bells of the Church of the Nativity - where Christians believe Christ was born. At midday there is a small candle-lit procession inside. 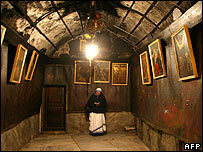 Monks in brown robes walk slowly down into the grotto, chanting in rich honeyed Latin tones. The smell of incense wafts around the tight dingy space. Publicly Christians here insist there is no friction with the Muslim majority. Earlier this year though the Islamist Hamas movement came to power. And in private some say they now dress more conservatively. There have also been fights between Christian and Muslim families. Father Majdi Syriani says the problem is not local, but global. "The whole world is polarising around western Christianity and Islam," he says. "This is a true threat, not for me but the whole world." "Bethlehem is the focal point. It's not because my Muslim people are threatening me. It's because the whole world is polarising. And it scares me." 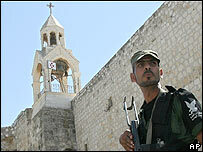 Bethlehem's Christians are not just scared. They feel weak and squeezed. And many are deciding that the best way to protect themselves is to leave. "Christianity started here and should continue to remain here," says George Ghattas, at the Latin Patriarchate. "You would worry if the origin of that religion is basically monuments and shrines and stones, but you don't have faith believers."